You will be happy to get the news from Gregg Braden, author of The Isaiah Effect and Awakening to the Zero Point. At one of his all-day intensives on Sunday, October 14, 2001, here is only a SMALL portion of the information he covered. 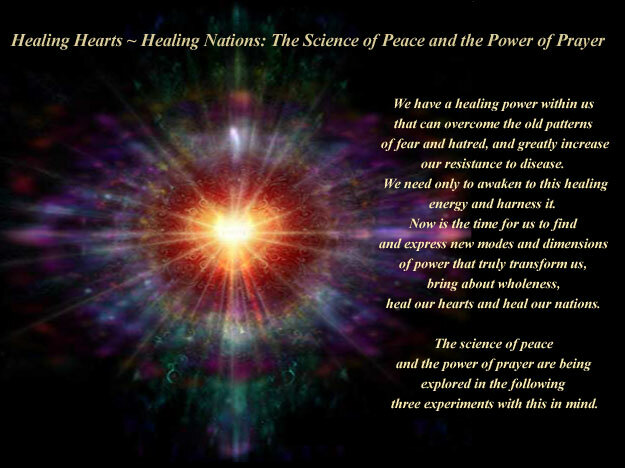 The title of this program was Healing Hearts~Healing Nations: The Science of Peace and the Power of Prayer. Braden started off discussing how in the past we lost huge amounts of information from ancient spiritual traditions (when the library at Alexandria burned we lost at least 532,000 documents), and that there may be information in those traditions which could help us understand some of the mysteries of science. To this end he reported on three very interesting experiments. Braden started off as a scientist and engineer, before he began pursuing these larger questions. The first experiment he reported was done by Dr. Vladimir Poponin, a quantumbiologist. In this experiment, first a container was emptied (i.e., a vacuum was within it), and then the only thing left in it were photons (particles of light). They measured the distribution (i.e., the location) of the photons and found they were completely random inside the container. This was the expected result. Then some DNA was placed inside the container and the distribution (location) of the photons was remeasured. This time the photons were LINED UP in an ORDERED way and aligned with the DNA. In other words the physical DNA had an effect on the non-physical photons. After that, the DNA was removed from the container, and the distribution of the photons was remeasured again. The photons REMAINED ORDERED and lined up where the DNA had been. What are the light particles connected to? These were experiments done by the military. Leukocytes (white blood cells) were collected for DNA from donors and placed into chambers so they could be measure electrical changes. In this experiment, the donor was placed in one room and subjected to "emotional stimulation" consisting of video clips, which generated different emotions in the donor. The DNA was placed in a different room in the same building. Both the donor and his DNA were monitored and as the donor exhibited emotional peaks or valleys (measured by electrical responses), the DNA exhibited the IDENTICAL RESPONSES AT THE EXACT SAME TIME. There was no lag time, no transmission time. The DNA peaks and valleys EXACTLY MATCHED the peaks and valleys of the donor in time. This is the experiment that relates directly to the anthrax situation. In this experiment, some human placenta DNA (the most pristine form of DNA) was placed in a container from which they could measure changes in the DNA. Twenty-eight vials of DNA were given (one each) to 28 trained researchers. Each researcher had been trained how to generate and FEEL feelings, and they each had strong emotions. When the researchers FELT anger, fear, frustration, or stress, the DNA responded by TIGHTENING UP. It became shorter and SWITCHED OFF many of our DNA codes! If you've ever felt "shut down" by negative emotions, now you know why your body was equally shut down too. The shut down of the DNA codes was reversed and the codes were switched back on again when feelings of love, joy, gratitude and appreciation were felt by the researchers. This experiment was later followed up by testing HIV positive patients. They discovered that feelings of love, gratitude and appreciation created 300,000 TIMES the RESISTANCE they had without those feelings. So here's the answer to what can help you stay well, no matter what dreadful virus or bacteria may be floating around. Stay in feelings of joy, love, gratitude and appreciation! These emotional changes went beyond the effects of electromagnetics. Individuals trained in deep love were able to change the shape of their DNA. Braden says this illustrates a new recognized form of energy that connects all of creation. 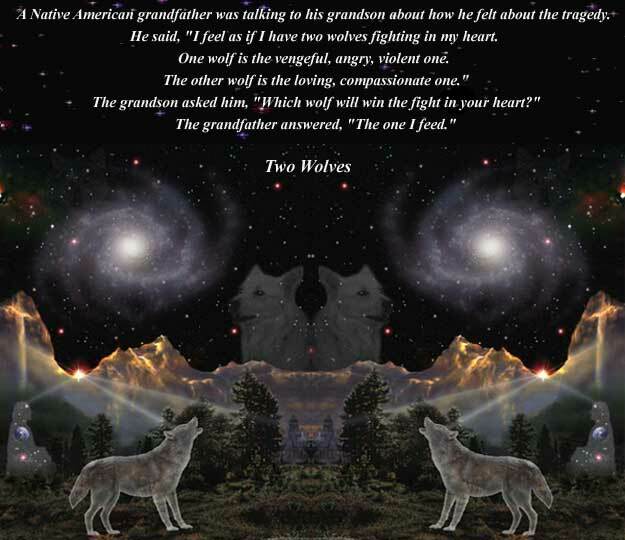 This energy appears to be a TIGHTLY WOVEN WEB that connects all matter. Essentially we're able to influence this web of creation through our VIBRATION. What do the results of these experiments have to do with our present situation? This is the science behind how we can choose a timeline to stay safe, no matter what else is happening. As Gregg explains in The Isaiah Effect, basically time is not just linear (past, present and future), but it also has depth. The depth of time consists of all the possible prayers and timelines that could ever be prayed or exist. Essentially, all our prayers have already been answered. We just activate the one we're living through our FEELINGS. THIS is how we create our reality ~ by choosing it with our feelings. Our feelings are activating the timeline via the web of creation, which connects all of the energy and matter of the Universe. Remember that the law of the Universe is that we attract what we focus on. If you are focused on fearing whatever may come, you are sending a strong message to the Universe to send you whatever you fear. Instead if you can get yourself into feelings of joy, love, appreciation or gratitude, and focus on bringing more of that into your life, you are going to avoid the negative stuff automatically. You can prevent getting anthrax or any other flu, virus, and so on, by staying in these positive feelings, which maintains an incredibly strong immune system. So here's your protection for whatever comes: Find something to be happy about every day, and every hour if possible, moment to moment, even if only for a few minutes. This is the easiest and best protection you can have. If nothing else, be joyous that the criminals have "already been caught" by the Universe! How Can We Permanently End Terrorism?